Containing fresh, natural ingredients with locally sourced meat Brandy Chunks in Gravy is perfect for giving your dog a balanced diet. When you give your dog Brandy, you know you’re feeding them a tasty, nutritious meal they’ll love! Unique to Brandy is the use of 100% Irish Meat across our canned range. 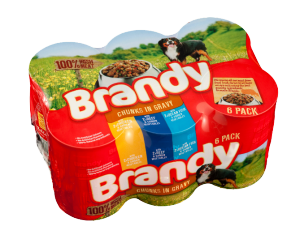 We’ve been making Brandy for over 40 years and we know what keeps your dog happy and healthy. Using fresh, natural ingredients with locally sourced meat, Brandy gives your dog – whatever the size – a balanced diet, full of protein for energy and added vitamins and minerals for all round health and vitality. Chicken & Garden Vegetables: Meat and animal derivatives (minimum 37%, including minimum 4% Chicken), Derivatives of Vegetable Origin (minimum 4% vegetables), Cereals, Various Sugars, Minerals. Beef & Garden Vegetables: Meat and animal derivatives (minimum 37%, including minimum 4% Beef), Derivatives of Vegetable Origin (minimum 4% Vegetables), Cereals, Various Sugars, Minerals. Ocean Fish & Garden Vegetables: Meat and animal derivatives (minimum 37%), Fish and Fish derivatives (minimum 4% ocean fish), Derivatives of Vegetable Origin (minimum 4% Vegetables), Cereals, Various Sugars, Minerals. Vitamin A 3750IU/kg, Vitamin D3 380IU/kg, Vitamin E 5.63mg/kg, Zinc Sulphate monohydrate 107mg/kg, Manganese Sulphate 11.71mg/kg, Sodium Selenite 0.82mg/kg, Calcium Iodate 0.6mg/kg. Protein 8.7%, Fat content 6.4%, Crude Fibre 0.3%, Inorganic Matter 3.0%, Moisture 80%. Store in a cool, dry place. After opening keep unused contents in a lidded container, keep refrigerated and use within 24 hours. Best served at room temperature.